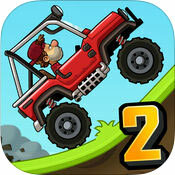 Show Gravity Who's Boss in this Thrilling Off-Road Racer! It could use some more vehicles. This is for all you city slickers out there. You may believe in your paved roads, your traffic safety rules, and your laws of gravity and motion, but country folk like to keep things simple. If your car can move, then it's still good; there's no need to worry if it'll pass inspection or if its doors are still attached. Likewise, if you can drive it across a bumpy dirt road without flipping, scale a nearly-vertical cliff without sliding, or leap over a chasm and land on your wheels without popping an airbag, then it's a keeper. Most of all, if you're confident you could take your rust bucket and beat all your friends in an impromptu street race, then you'll know for a fact just how much better driving can be out here in the countryside. The roads of Hill Climb Racing have always been dangerous. They're bumpy, they go straight up mountains, wind along cliff-sides, and are riddled with gargantuan gopher holes. That's just the way Newton Bill and his ilk like it! As you struggle to stay upright on those same bumps, burn your tires trying to scale those mountainsides, and go flying into the air, you'll learn to like it too. Drive across the most dangerous roads in the Farmlands, the Forests, the Mountains and more. 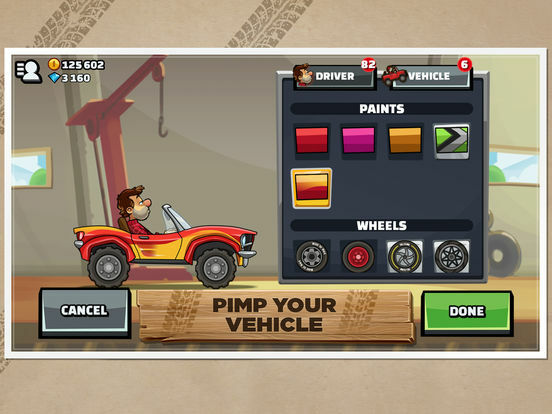 Collect an array of crazy off-road vehicles, including a jeep, a scooter, a dirt bike and a monster truck. Pull off wheelies, stoppies, aerial flips and other tricks to earn bonus coins. Drive as far as you can go on the bumpy roads of Adventure mode. Race against up to four player-made racers in Cup challenges. Win prizes and increase your standing on leaderboards all across the globe. It takes guts, grit and a lot of trips to the emergency room to make a name for yourself on the roads of Hill Climb Racing 2. However, it also takes some well-greased wheels and an engine that purrs. Take care of your ride, give her some much-needed improvements, and she'll take care of you. Upgrade your vehicles. Improve the grip in your tires, your all-wheel drive, the quality of your engine and more to make climbing over those steep hills a breeze. Tune up your vehicle. Set its speed, balance, weight and more so that it moves exactly how you want it to. Personalize your driver and your car. Choose from an assortment of tires, paint jobs, heads and clothes to make a one-of-kind avatar that's ready to hit the road. If you like driving, if you like thrill-seeking, if you like competition, and you cannot absolutely stand gravity, then it's time to abandon everything you know about the racing genre and give old Hill Climb Racing 2 a spin. It's got everything: racing, tricks, hazards, vehicles, more hills to climb than you can shake a stick at, and plenty of chances to kick gravity right in the keister! With Hill Climb Racing 2, you can experience all the fun that driving has to offer without any of the hassle from Mister Sir Isaac Newton. Hill Climb Racing was a physics-based driving game that tested your ability to operate a vehicle in a world where gravity forgot to drink its morning coffee. The car's odd bounciness and the treacherous terrain forced you into a constant balancing act to make sure your nose was always level with your rear. As such, it was challenging, very silly-looking, and a load of fun! It was only natural that Fingersoft would eventually develop a sequel, and not only have they delivered everything that made the original so addictive, but they made it even better! Hill Climb Racing 2 plays just how you would expect it to. Your hillbilly gets behind the wheel of an off-road vehicle and proceeds to tear up the countryside, kicking up clouds of dust while struggling to stay upright. The controls are simple; you have the gas on the right side of your screen which accelerates your ride and moves it forward, and the brake on the left that slows it down and puts it in reverse. However, that's about a far as the simplicity goes, for hilly roads and Newtonian forces combine their might to flip you over every step of the way. Needless to say, Hill Climb Racing 2 is tough, but it avoids being frustrating. This is partially due to how it rewards skill, but it's mostly because it's so funny to see in action. Gravity is a harsh mistress in this world; she'll try to push you down a mountain one moment, and she'll make you airborne for driving too fast the next. Alternating between the pedals in rapid order, often in midair, is the only way to keep your balance, and as such, the game can get tense within minutes. It helps that the developers are fully aware of how hilarious a game like this looks in motion, and have done everything they could to capitalize on that. The first Hill Climb Racing app wasn't bad by any means, but it admittedly looked amateurish. The visuals were flat, and every character, object and scene looked like it had been made in MS Paint. That's no longer the case in Hill Climb Racing 2. Everything is sleeker now; the colors are more vibrant, backgrounds are distinctly layered, and you'll even pass by things in the foreground. Care was done to make the worlds feel more alive as well, with mooing cows in the Farmlands, and grunting moose in the Forest. Vehicles have also received a very welcome visual overhaul. Whereas the first game made cars look like they were made of paper, this app adds a more believable bounce to their animations. They leave a trail of black smoke behind them as they move, and kick up a lot of dust too, particularly whenever the wheels start skidding. A lot has been done to give the cars in this game a lot of character, and it makes watching them move in ridiculous ways all the more amusing. If there is one weakness in the visuals, it's that the characters could afford to be a bit more expressive. While their heads will humorously bob back and forth as their car bounces and rolls, they always wear the same placid expression as they go. It's not a big deal, but animating distinct emotes would have given them a lot more personality. There are two modes of play in Hill Climb Racing 2. The first is the basic Adventure game where you see how far you can take your vehicle before you finally crash or run out of fuel. It's fun enough, very challenging, and includes some nice quality-of-life features to improve gameplay, like notifications for when you're approaching a much-needed can of gasoline. However, the real star of the show is the all-new racing mode. 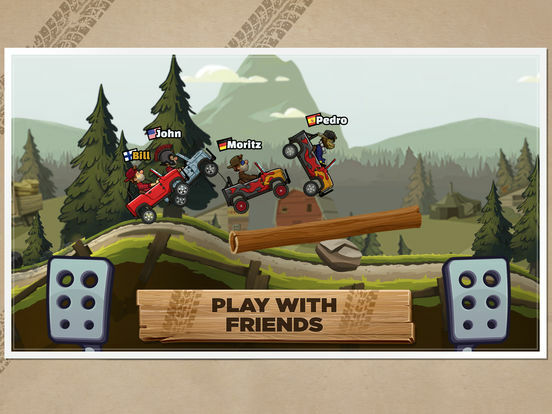 Here, the app lets you go hog-wild against three player-created cars and drivers. If seeing one vehicle spinning, tumbling and bouncing around looked funny to you, imagine seeing four at once. Not only that, but racing requires a whole different style of play from the solo game; since speed is the order of the day, you'll often be called to make more risky maneuvers just to get ahead of the competition. You could roll slowly down the side of a hill just to be on the safe side, for instance, but if you careened off the summit at full speed and took to the sky instead, then you might gain some distance over the other guys, provided you land wheel-side-down. There's plenty of game to be found as it is, but Fingersoft still saw fit to provide plenty of extra goodies to unlock as you play. These include cosmetic things like different heads, hats and clothes to deck your driver in, as well as varying paint jobs and tires for your vehicle. But you can also unlock a variety of different rides that each play differently. The jeep you start off with is slow but relatively stable, but you can also get a hold of a scooter which is fast but more liable to flip, a maneuverable dirt bike that can pull off all kinds of aerodynamic tricks, and even a sports car. Oftentimes, choosing the right transport for the job is the key to winning the more challenging races. It doesn't end there. Vehicles can be upgraded in a number of areas to improve their performance. You can increase a car's speed, the traction of its tires, stabilize its suspension, or make it more capable of driving up steep cliffs. On the surface, it seems like the higher they are, the better, but the game goes much deeper than that. Improving some attributes of your car can actually be detrimental on some tracks if you don't do something to balance it out. For example, a faster car is more liable to flip on uneven terrain if you don't upgrade its suspension enough. Hence, you have the option to tune your ride, setting the level of its parts as high or low as you want. This adds a nice strategic layer to an otherwise simple game. The only wrinkle is that the app feels a bit lacking in modes of transportation you can use, but that's a minor quibble. Hill Climb Racing 2 is everything a great sequel should be. It has all the elements that made the original a fun romp, it improves upon its detriments, and adds a whole lot more to make a quality product that stands on its own. Not only that, but it's such a nice consumer-friendly app. There are no energy meters, no pay walls, and no ads forced down your throat. Commercials are there, but watching them is completely up to you, though doing so can be worth it as it usually gets you free stuff. For those reasons, Hill Climb Racing 2 is definitely one of the best mobile games out there. Get it!